If you’ve ever browsed the plentiful booths of fresh, local produce at the Bellingham Farmers Market and wondered what you would do with the seasonal vegetables if you brought them home, the Chef in the Market series is right up your alley. These demonstrations highlight those chefs that go the extra mile to bring locally farmed products to consumers’ plates,” said Bellingham Farmers Market Director, Caprice Teske, of chef’s like Ciao Thyme’s Mataio Gillis. Photo courtesy: Bellingham Farmers Market. to use local ingredients in your own kitchen. Once a month, chefs from two restaurants pair up to create a simple dish, demonstrating preparation techniques, tips and recipes. Founded in 2002, the mission of Sustainable Connections is to be the forum where businesses come together to transform and model a vibrant local economy built on sustainable practices. The Chef in the Market series does just that by tightening the connections between chefs, farmers and local consumers. “We’re excited to help,” said Sara Southerland, Sustainable Connections’ food and farming manager. “The Chef’s Collaborative is designed to strengthen the food and farming community through relationships, and Chef in the Market ties it all that together.” Tighter connections between farms and restaurants lead to chefs buying more produce from local farmers, and market demonstrations allow consumers to be empowered to try the same seasonal produce at home. 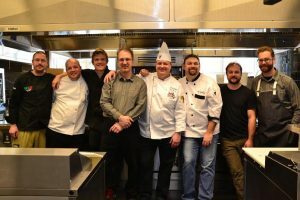 The Chef’s Collective is designed to strengthen the food and farming community through relationships. Photo courtesy: Bellingham Farmers Market. “Chef in the Market is a great opportunity to get new ideas,” Southerland added. “When you go to the market, you see all that beautiful produce. It can be overwhelming to think what you’ll do with it. Chef in the Market offers simple, easy recipes. Plus, it’s fun to meet the chefs and support local farmers.” An added bonus: The demonstrations include free samples, so you’ll never have to wonder if it’s worth trying the recipe at home. If you’re stuck in a food rut at home there’s no better way to break free than being inspired by new ingredients and methods. 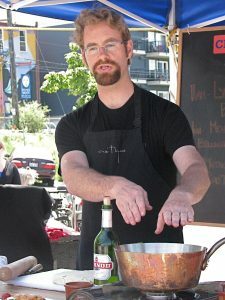 Find the Chef in the Market series at the downtown Bellingham Farmers Market on the third Saturday of each month, running every half hour from 11:00 a.m. to noon.